It’s Summer time at Thurles Shopping Centre and we are holding our First Ever Teddy Bears Picnic which is FREE of charge to all our customers. Come & Join us for an afternoon of FREE Entertainment and Goodies as our way of saying thank you for shopping at Thurles Shopping Centre Our programme of events will begin at 1.30pm there will be picnic packs for the children as well as the our brand New Children’s’ Carousel and our very special guest Thurles Shopping Centre Teddy Bear Mascot himself will ensure fun for all. There will be free kids picnic packs, face painting, picnic area & Children’s Entertainer throughout the afternoon. Why not bring along your favourite teddy bear to the picnic. 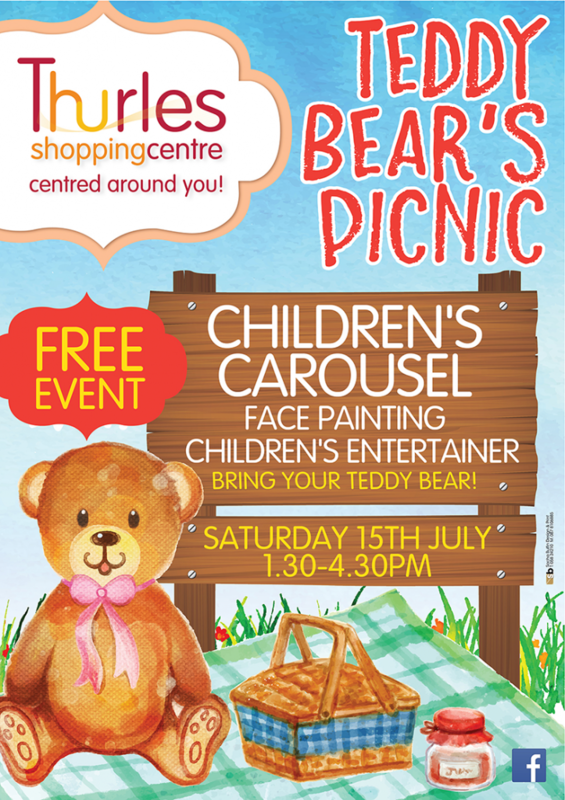 So remember to join us at Thurles Shopping Centre on Saturday 15th July for our Free Teddy Bears Picnic from 1.30pm all courtesy of Thurles Shopping Centre.